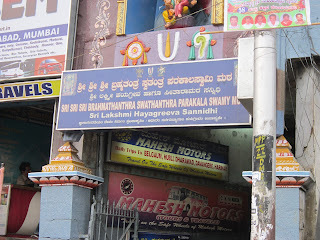 Sri Lakshmi Hayagriva Swami Temple is near to Bangalore bus stand i. e. majestic. 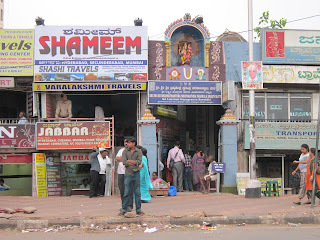 I had been there once to attend one of my friends brother’s Brahmopadesham. Temple is an old one but now partly hidden as its entrance is surrounded by many shops of travel agencies. Rarely any one can know the existence of such temple in midst of such shops and wonders if any one visits inside. Temple is nice with many architectural design and cool environment, making people to love it at first sight. Temple also has rare statue of Lord Hayagriva which is not so popularly present in all places. Recently the temple was showed in one of popular Television channel’s premier show. Show was for thirty minutes and it gave highlights of temple and its history. After reaching Bangalore I went to one of my friend’s home to refresh before leaving to Vellore. It was in morning 5’o clock and didn’t notice much about temple as it was quite dark also. I stayed at friend's home itself as he forced to stay as I visited him after a long time. Update: Based on request of readers photos of temple location is posted.